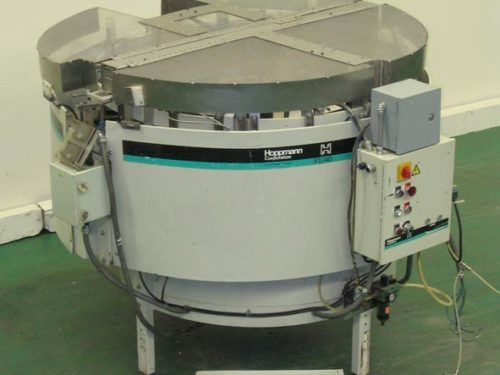 Hoppmann, Model FT50 CRS, automatic 50" diameter, rigid disc centrifugal bowl feeder rated from 100 to 2000 pieces per minute – depending on materials, appliaction and machine configuration. Equipped with a 42" x 42" x 30" hopper with 9½ wide x 35" long rubber conveyor live bottom. Lift up lexan safety guard cover with interlocks, 66" diameter outer ring, and 48" diameter inner bottom product ring, and ram air conveyor with a 1 HP blower. Mounted on stainless steel base stand with (6) swivel casters and a discharge height of 33".